As you know, at least I blogged about it already so you should know, the kids and I signed up for the reading program at the library. We've been doing alright. Kade's winning with 8 books but the stories he listens to at night count. I'm sure I've missed a few. 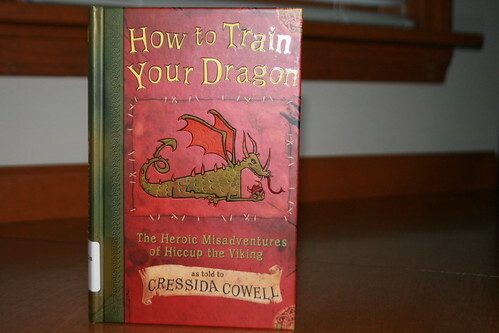 Anyway, for the last little while I've been reading "How to Train Your Dragon" to Kade. (Then the book counts for both of us.) We finally finished it tonight. I think this is the first book I've ever said this about. I hope the movie is better than the book. Ha! I started that book and couldn't make it very far through it. I agree with you completely. The four of us loved that book! I thought the movie was going to be about a group of Vikings that didn't like dragons. I have used that yelling method of training with both boys and it works! !